Every time I make fish this way, I find myself asking why I don’t make dishes like this more often. It’s incredibly simple, quite healthy, and way quick. And, don’t worry, it’s also totally delicious–I still have my priorities straight. 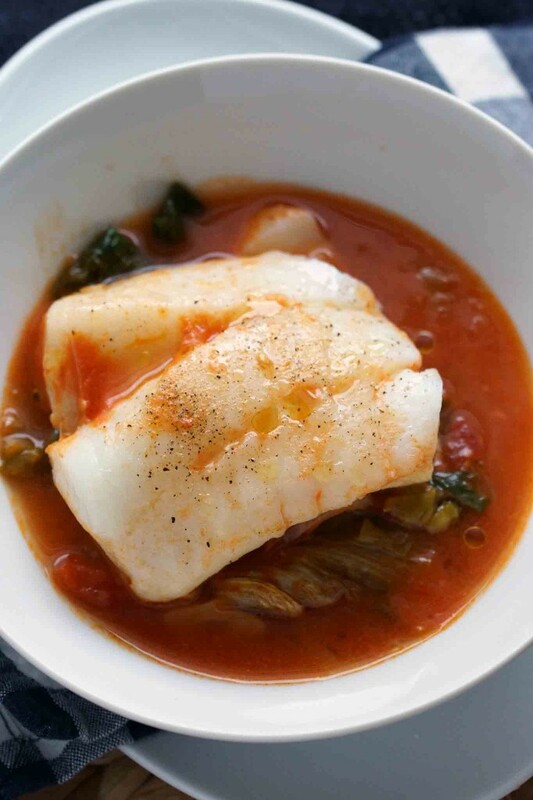 This is cod that’s been poached in a tomato and white wine broth with garlicky sautéed escarole. The fish cooks up moist and flavorful, flaking apart in buttery chunks. The broth will amaze you with how good a can of tomatoes can taste with just a few nudges. 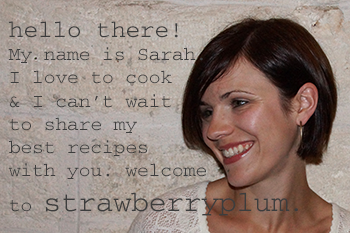 You’ll be slurping it up with a spoon and contemplating just how soon you’ll make it again. Okay, let’s do dinner. You’ll need a head of escarole, a can of tomatoes, a couple of cloves of garlic, an onion, a squirt of anchovy paste (or a couple of fillets), a glass of white wine, and a piece of fish. I chose cod half because I was inspired by a recipe I saw in a magazine and half because it looked like my best option at the fish counter. Any mild white fish that can hold its own will work here. 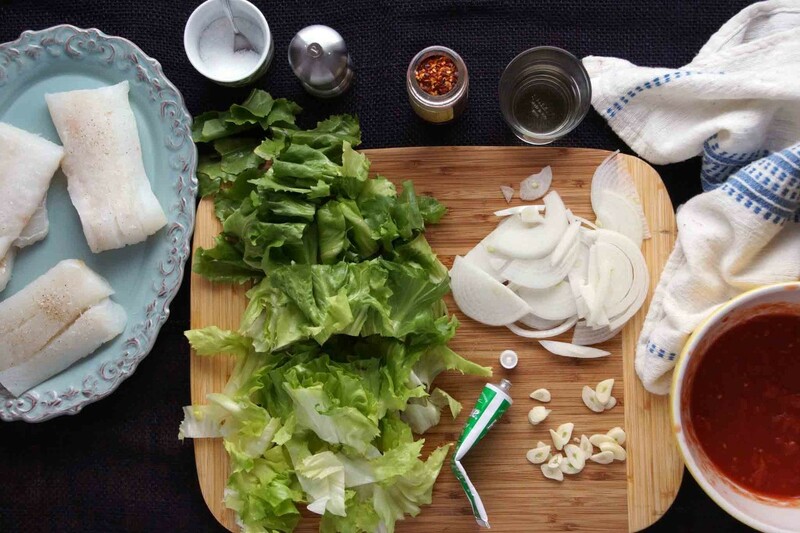 Cut the fish into individual portions, chop the escarole, slice the onion and garlic, crush the tomatoes, and we’re ready to get cooking. Allow me to translate–dinner is 15 minutes now from the table. Start by sweating the onion for a couple of minutes. As they begins to wilt, add the garlic, a little red pepper, and a dab of anchovy paste. A good many of my favorite dinners begin in this exact fashion. Now toss in the escarole. 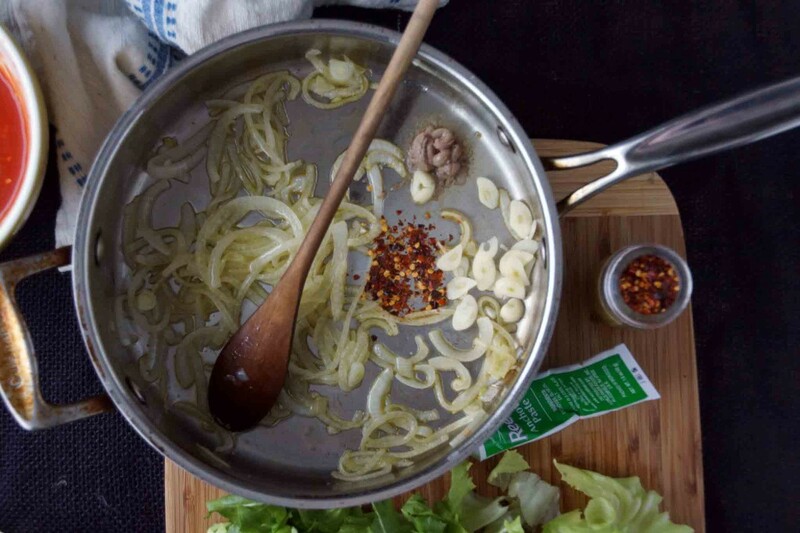 Give it a stir and let it shrink down and absorb some of the good, garlicky flavor. Add the tomatoes and white wine and simmer for a few minutes until the flavors meld. Give it a taste. Good? Great? Glad to hear it! Now nestle the fish into the tomato broth. Cover the pan and simmer until the flesh of the fish becomes opaque and will flake apart when prodded. …to make this again. Real soon. 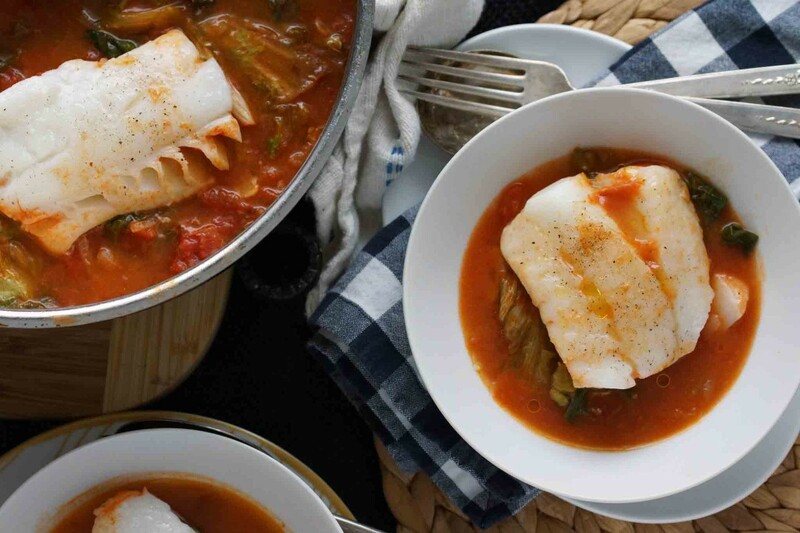 Serve with plenty of crusty bread to soak up the tomato broth. It is also good served over rice or couscous. Heat about 2 Tbsp. of olive oil in a wide skillet over medium-high heat. Add the onion and season lightly with salt. Sauté until the onion is translucent, about 2 minutes. Add the garlic, anchovy paste or fillets (if you're using fillets, just break them up with your spoon and they'll melt right into the sauce), and red pepper; sauté until the garlic is a very light golden, 1-2 minutes. Add the escarole, season, and toss until just wilted, about 1 minute. Add the crushed tomatoes, wine, and about ½ c. of water. Bring the liquid to a boil, then reduce to a simmer. Simmer for 5-10 minutes until the flavors have melded. Taste and adjust seasoning as needed. Reduce the heat to maintain a slow simmer. 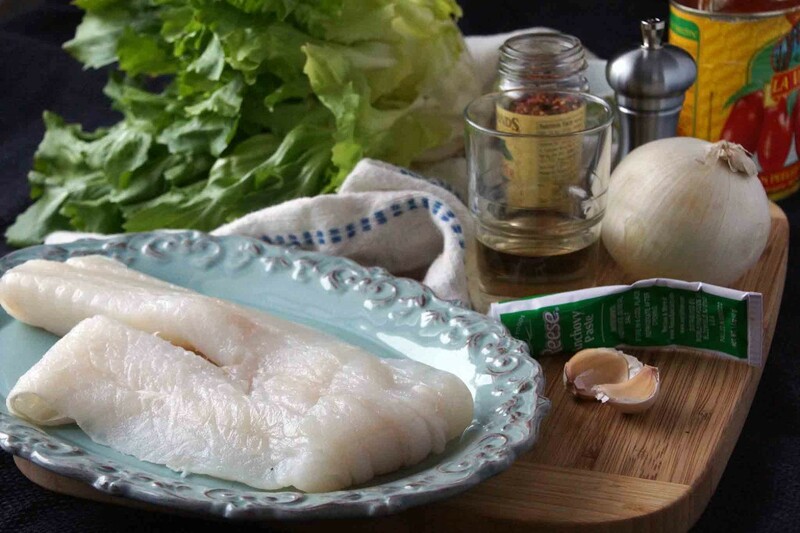 Season the cod fillets with salt and pepper. 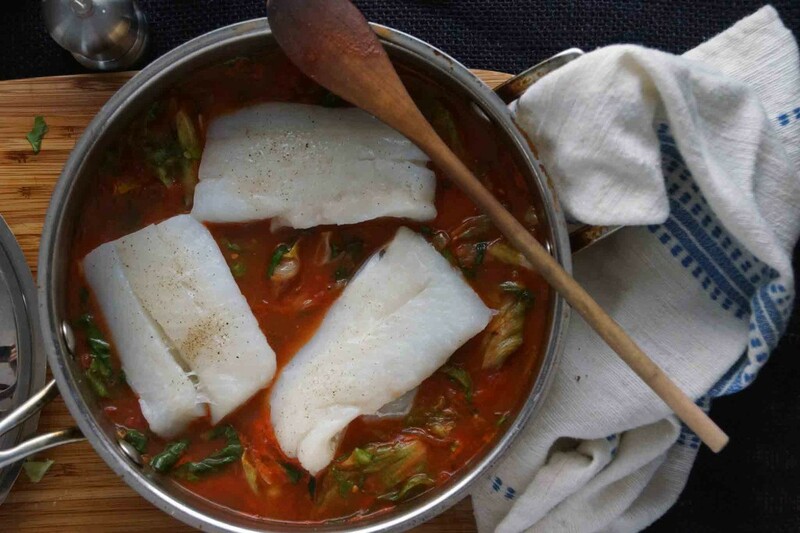 Nestle the cod into the tomato broth, cover the pan, and simmer until the fish is opaque and just starting to flake, 6-8 minutes. If some of your pieces of fish are thicker than others, it's best to get them cooking a minute or 2 before the thinner pieces. 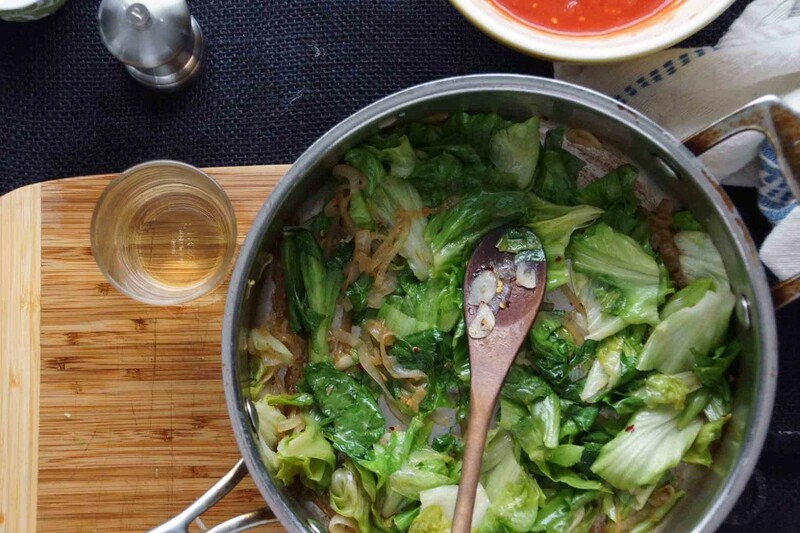 Divide the escarole between warm bowls. 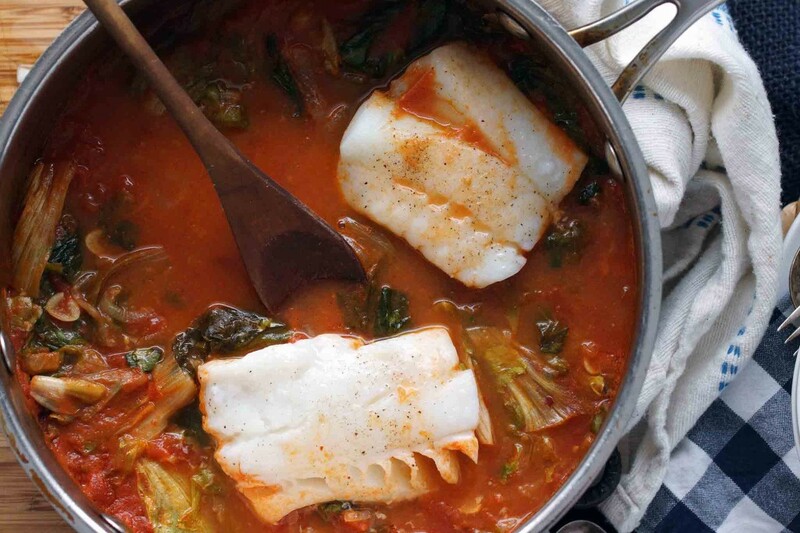 Set a piece of cod in each bowl and spoon the tomato broth over the top. Drizzle with a little olive oil and serve. Quinoa & Tuna Stuffed Tomatoes: warning–these are addictive! I love poaching fish in a bit of stew, so healthy, and better than defaulting to pan sautéed fillets. I never made escarole this way though, I’ll have to give it a try! Happy new year! Happy new year to you, too! I’ve been meaning to tell you how much I’ve been enjoying your Costa Rica pictures. Looks like you had a great trip! This looks so good! I’ve been looking for some new fish recipes so I’ll be trying this one soon! I have just sent a link to this post to my Mother. Hopefully she’ll take the hint and make it for me the next time I visit! Nice, I hope it works!